If you buy me an air ticket, I will immediately fly off to Spain. I have always read about the Spanish culture, and I think that the whole idea of bar-hopping is brilliant. Unfortunately, we do not have that many Spanish restaurants and tapas bars in Singapore and it doesn’t make sense to cab from one end of Singapore to the other. But hey, I think it will be really cool to find a group of friends for a night of tapas-bar-hopping. Don Quijote at Dempsey Hill is a nice place to go to if you are craving for Spanish food. While prices are not cheap, they are not too exorbitant – it is on par with most of the better Spanish Restaurants in Singapore. Formerly known as The Tapas Tree, Octapas Spanish Tapas Bar launched back in August this year. If you are in the Clark Quay area, drop by Octapas to satisfy your Spanish food cravings. Housed within a shop house on Duxton Hill, Sabio Tapas Bar has been designed to represent an authentic tapas bar in Spain. It is a good place to chill out with a group of friends. Fans of Sabio will be happy to know that it has recently opened a second outlet, Sabio by the Sea at Quayside Isle. If you are a fan of tapas, Salt Tapas Bar at Raffles City by celebrity chef Luke Mangan is one place that you should check out. It serves Aussie-style tapas with the freshest ingredients. 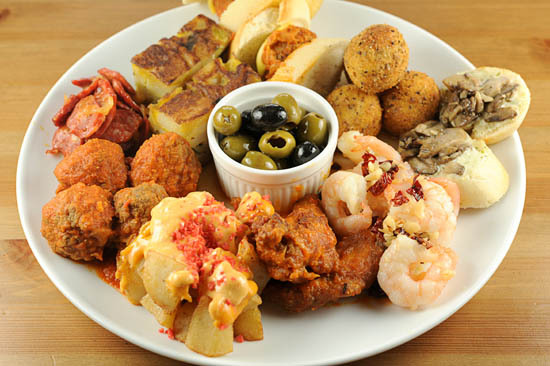 Sabroso Tapas bar at Holland Village has a Spanish Tapas Buffet Dinner which features 16 tapas at $32++ per head, from Sun to Thu from 6pm – 10pm. Most people probably won’t associate Spanish Tapas with Little India, but that’s exactly where Zsofi Tapas Bar is located. The whole area may be a little sleazy, but Zsofi Tapas Bar is cosy and unpretentious, and most importantly the Spanish food is affordable. my kingdom for a churro con chocolate or some tapas!! Thanks for putting together this list, I really would like to try Santi´s restaurant. oh, beautiful pictures, those churros are hunting me now! I wonder which spanish restaurant in singapore serves the best beef tripe. Brad have you tried any? Anyone else? It is nice to look and for flavor!!! Hi there, I happened to look onto ur blog one day juz looking for recommendation for a brunch. And I would come to ur blog for ideals when I wanna try some new restaurants! And today I came and I saw this!! Spanish restaurants!! Omg! If I have an air tix I would definitely fly to Spain! And for sure it’s a one way tix! I have tried few restrant on ur list, juz to add on to ur reviews. Try the brunch on Sunday! They have variety of tapas and if I remember correctly is unlimited serving. So u can try all u can. (if my memoy didn’t fail mi k) but be mindful tt u need to book in advance! They are usually full!! And with long waiting list. 3. My little Spanish place. Personally I like the ambience. their paella is not the best and compare to serenity I prefer the second. Theirs are dry and not as tasty as the one in serenity. Nonetheless the sangria is good. I would go there with my partner or close friend for a dinner. That all I have tried. I would love to try the food @ la vida they look and smell good, they should taste good too! Keeping my fingers cross! Looking forward for ur updates on the rest and food! Oh, I remember those churros! You will LOVE Spain. I promise you that. I think there is a relatively new tapas place at Holland Village. There is a new place, Nueva Cuba at Custom house. great list. I’ve personally tried 3 of the restaurants on it and I would strongly recommend don quijote for their squid ink paella and zsofi for their tapas and affordable sangria, not to mention the super funky laidback ambience. Serenity for paella! <3 Hi Brad, hope you've been well. Your blog always makes me sooooo hungry. Best spanish food in town I’ve tried was in Streeters in Keong Siak. Don’t know whether they are still around. COuld never forget their garlic prawn and portobello. The list looks enticing! As a Singaporean living in Spain, I’m quite keen on judging the authenticity of these Spanish restaurants for myself. I’ve only tried out churros at Alegro and left feeling pretty damn impressed – my Spanish partner himself was full of praises for it as well. i’ve recently chanced upon a newly opened spanish restaurant located at tanjong katong area, Cocina De Pasion. tried their paella which is savoury & “wet” to my liking and can really taste the seafood in my mouth. another favourite is the lamb rack & sauteed mushroom in cream sauce. their items are reasonably priced and imagine paella only costs $17, one of the cheapest in the market. i tried paella from some other restaurant but i had to admit Cocina’s is still my personal best. very cosy ambience and shld grab their 1-4-1 cocktail promo now, sangria & margarita!!! Thanks for the recommendations – would be awesome if you could add the price range (or low/medium/high etc) too! We are a B2B e-commerce company?and the leading and dominating company in the text link ads market in Asia. We have many customers who are longing for text links. We sincerely wanna purchase some text links or simple banners ads from you. Would you please tell me the price of one text link on the homepage of https://www.ladyironchef.com for 3 months or 6 months? Cocina de Pasion seems to have already closed down. Wonder where they have moved to? Here are the ratings of the churros i’ve tried so far..
Just to let you know – appreciate your sharings!